ALL THE WORLD’S A STAGE, SO LET’S KEEP IT PROPERLY LIT. 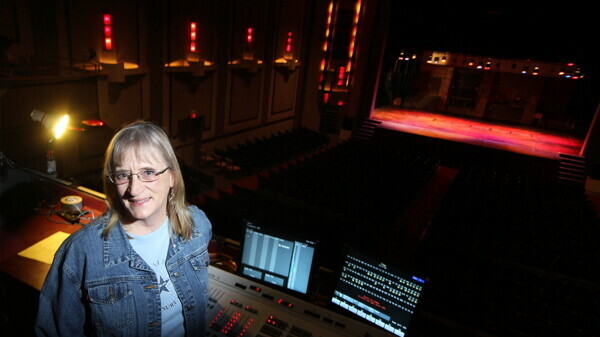 Local light designer Paula Dinkel stands before The State Theatre’s light board. If you take a look at that last paragraph you will notice that twice there was the same impetus for the mood’s change - lighting. Stage lighting and all stage operations are at their very best when you almost can’t tell they are occurring. For that to happen though you need gifted and organized lighting designers at the helm. Luckily, in the Eau Claire theater scene we have those throughout, at all the theaters and at the University. Recently Paula Dinkel has moved to Wisconsin from southern California after doing lighting design in the theater and at amusement parks such as Euro Disney. Dinkel’s most recent work is Thoroughly Modern Millie at the State Theater. She says it the favorite show she has designed but readily admits she always says that about her last show. One of her biggest aspirations in coming to Eau Claire is sharing her knowledge in workshops to help build community involvement. At the Eau Claire Children’s Theater, Mike Jonas has been doing just that by training a volunteer crew of stage technicians. He says he does this because he values his opportunity to grow as a lighting designer first as a volunteer himself then as lead lighting designer at that venue. Jonas says the crew receives training while doing grunt work such as unloading trucks full of lighting fixtures and physically hanging the fixtures on beams above the stage (these beams are called “electrics” in the lighting world). Oftentimes his crew has to work punishingly early and late hours to get the lighting operational and dialed in. They do this in a day or two, while larger theater companies may have weeks to put shows of the same scale together. According to Jonas this crew comes from as far as 70 miles away just to get a chance to work very hard to put great shows together both at the Children’s Theater and also at the State Theater. Brianna Hotchkiss, lighting designer for the Eau Claire Regional Arts Center, says her favorite show she designed was RENT which she worked on with the Children’s Theater. With the possibility of the Confluence Project creating a new space, Hotchkiss has many more chances to create visceral spaces for people to enjoy performances. Her favorite potential space is the Black Box theater because they the types of stages which interest her most. One thing all the lighting designers interviewed agreed on is that if you are at all interested in this field there are many opportunities to volunteer in the community.